Despite their instant connection upon meeting which led to Douw and Helen dancing in an empty parking lot until sunrise and becoming instant best friends, they only started dating about 6 months after they met. Engineers tend to be regarded as down-to-earth and unromantic, but ultimately Douw proved himself to be otherwise when he whisked Helen away for a sunrise game drive at a lodge outside Johannesburg which turned out to be a hot air balloon ride and lovingly planned proposal. Faced with such a wonderfully planned and adventurous occasion, Helen naturally said “Yes”. Douw and Helen say that they are incredibly blessed to have a healthy relationship and friendship, and that being friends first is probably the biggest reason why they get on so well. They feel that they know one another inside and out, and celebrate their differences and respect one another greatly. They are both rather ambitious individuals but are committed to supporting one another in reaching their goals in life. While marriage may be hard they believe that shared values and morals make the possible hard parts a little easier. 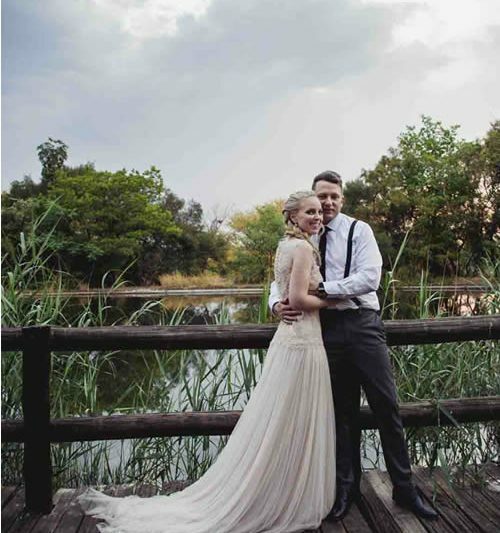 Douw and Helen Pretorius chose Pont de Val on the Vaal River as their wedding venue. As almost the last couple in their inner circle to marry, they did not want to use the same venue as other family members had done and wanted something different. To them, the venue drums up a feeling of being in another country, somewhere in France or Italy; immaculate, very well maintained and breathtakingly beautiful. 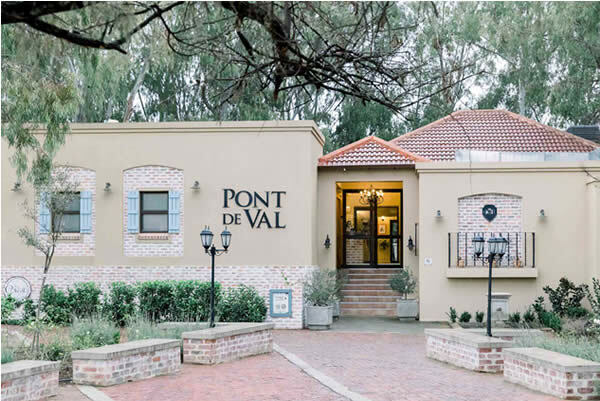 Helen’s discerning and stylish parents were equally delighted with the choice of Pont de Val as their venue, so they were extremely happy to book their date without further thought or questions. 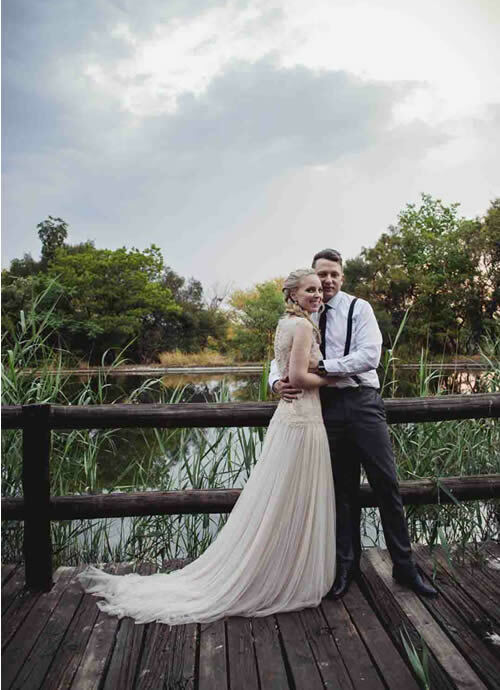 The couple was impressed with all the finer well thought-out details of the elegant and sophisticated venue, and loved the idea of having a river as a backdrop to their ceremony, under the many trees. 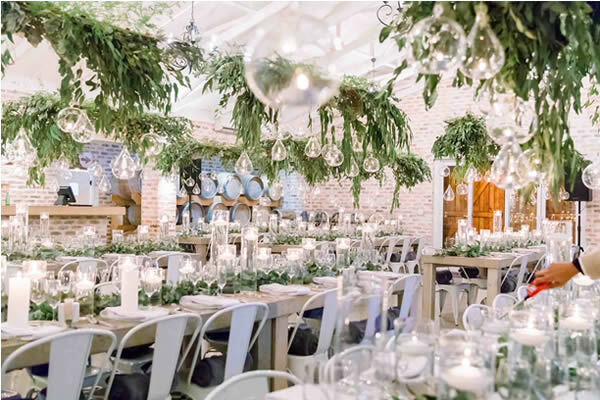 The venue is also known for its incredible food, ranging from the abundance of the harvest table to the delectable main course options and spectacular desserts. 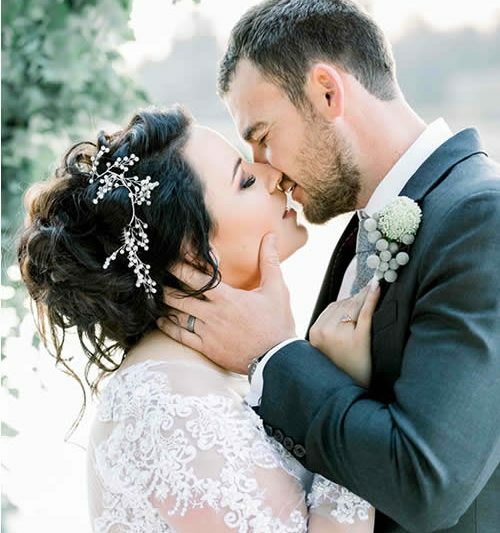 Being in another province, it was an absolute necessity that the venue’s service was excellent, and the bridal party and their guests were not disappointed. 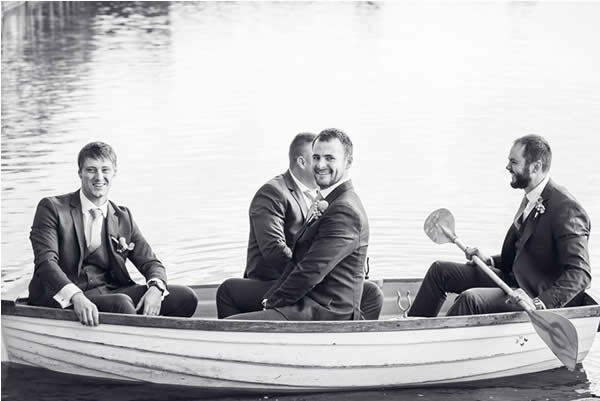 From their arrival for their only official viewing through to final execution the staff and wedding co-ordinator at Pont de Val were exceptionally professional and friendly and helped make the entire experience a memorable one. Helen describes their wedding as “magical”, despite the huge storm that morning which threatened to disrupt their wedding day. Being planned as an outdoor wedding this was naturally a concern, but fortunately the storm abated before lunch time and the ceremony was able to proceed without a hitch when the time came. The ceremony was conducted by a family member and to the couple was a celebration of what God intended love and marriage to be. The water flowing by in front of them while they exchanged vows in front of all their nearest and dearest was especially meaningful to them. Helen describes herself as “not a bunch of rose’s kind of girl”, and much prefers beautiful leaves and plants to flowers. 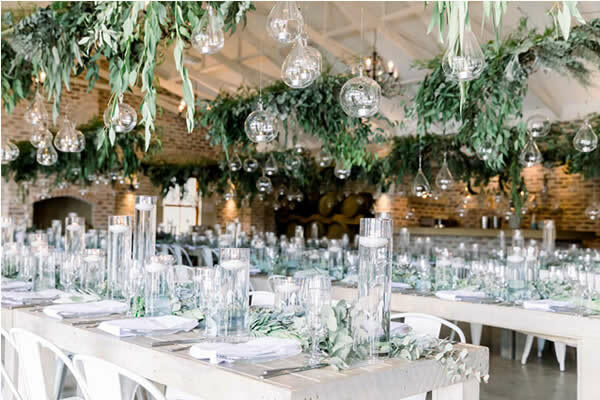 In creating the specific look that they envisaged, the couple opted to just do greenery and create lots of light and reflections with the almost 300 oval and round glass balls purchased by Douw, who was the mastermind behind the idea. Their main theme was glass and warm light which was both sophisticated and warm at the same time. 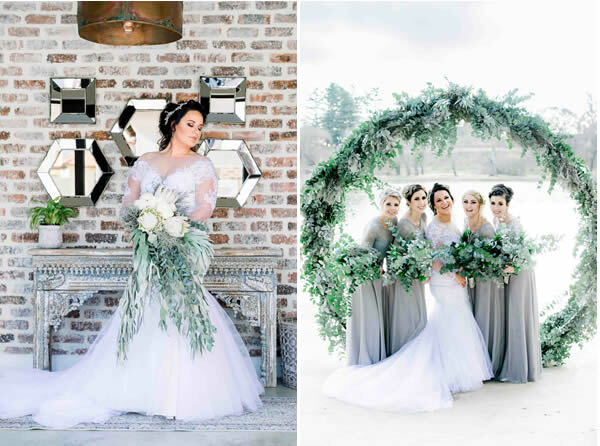 It was important to the couple to have a wedding with a timeless and classic look and in order to achieve this they used a combination of greenery incorporating as many different shades of green and grey as possible, as well as different textures. The menus, table numbers and guest names were all created out of acrylic/Perspex; one of the aspects Helen personally liked the most about the décor. Despite the many challenges they faced in implementing their ideas, Douw and Helen are very happy with the outcome; believing that they achieved exactly the look that they were hoping for. The hanging leaves and shiny glass balls throughout the reception area proved to be a show stopper and extremely beautiful. When it came to her dress, Helen found it difficult to decide as she was not entirely sure of what she wanted. She realised that the best thing is to choose something that you are comfortable with and that suits your body. 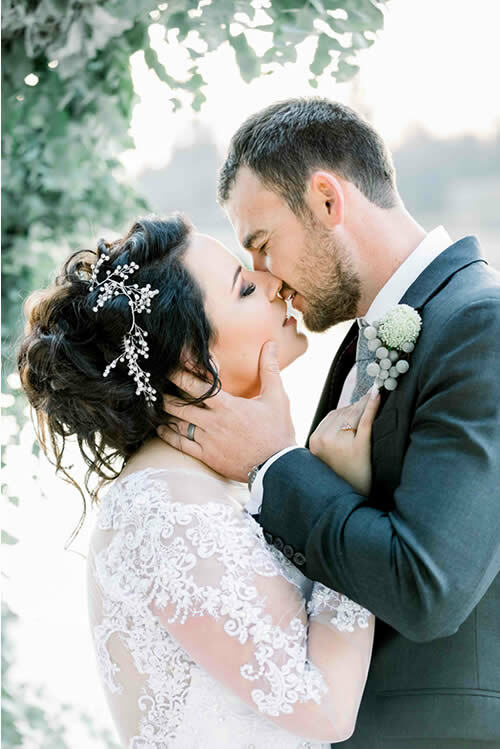 Although her ultimate choice was something completely opposite to the plain white fuss-free lace dress she originally envisaged, Helen says she felt incredibly beautiful and felt the more “intense” dress suited their elegant winter’s day wedding. The original plan for a loose and flowing hairstyle was exchanged for an up style to prevent her hair from snagging in the beading and pearls of her dress, which proved to be a wise choice. She loved her make-up, and that of her bridesmaids. Her blue shoes were self-designed, and she was very happy with the outcome. Douw and Helen made the occasion of their wedding personal and intimate to family by having Douw’s youngest sister bake their wedding cakes and his older sister and her husband provide the live entertainment. Both sisters are exceptionally talented, and they believe that booking vendors to complete these two tasks would not have been the same. It was special to them to celebrate and showcase their talents as part of their big day, and neither they nor their guests were disappointed. The cake disappeared within minutes, and much fun and laughter was generated in the course of the evening’s entertainment. The groom had his suit tailor-made and the groomsmen all looked (in Helen’s words) “so snazzy in their suits”. 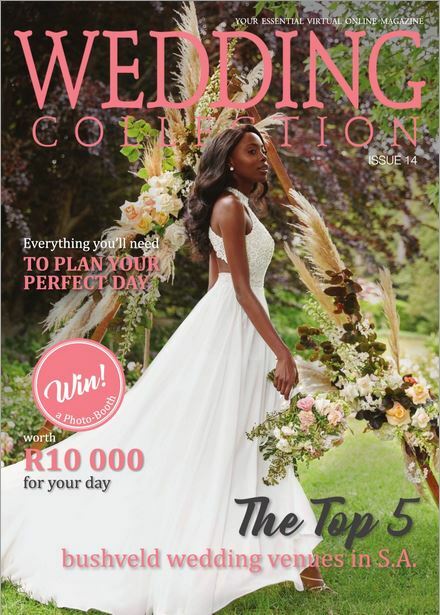 She believes that there is nothing quite like a well-fitting 3-piece suit on a man; and feels that as much time and energy as is spent on a brides dress should be spent on the groom’s attire also as it completes the entire look of the wedding party. 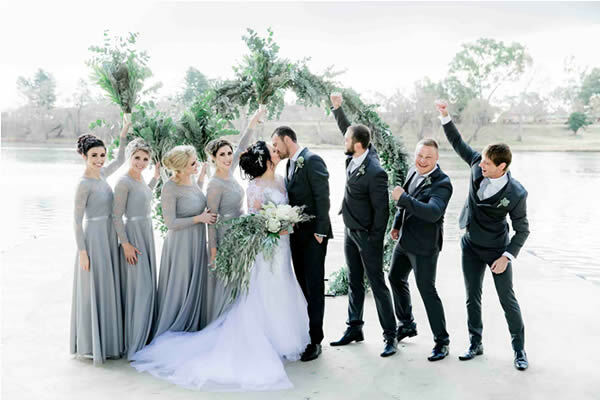 Hosting a winter wedding at night right next to the Vaal River prompted the idea of fleece blankets as guest favours, which proved to be exceptionally popular and well-received. The beautiful hand written note addressed to Mrs. Pretorius left for me by Douw. My heart melted reading his surname next to my name for the first time. Walking down the aisle to meet Douw. I was so emotional already, and when I walked down the aisle I just started sobbing. I was so happy to see him! Dancing with my dad. He and my mom practiced for weeks at home as he isn’t the dancing type, so having him take a swirl with me was so special. Our décor was a definite highlight for us. Can you say sticky beef brisket roll? The food was incredible! The speeches were beautiful and heart-felt; we are blessed with so many loved ones. Our Videographer; One Fine Day were the two sweetest souls and we were so happy we decided to do a video, their work is remarkable! Smooth sailing from the ceremony to the reception, everything was just our dream come true.